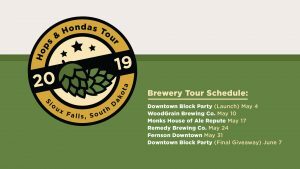 Enter for a chance to win a 2-year 2019 Honda Passport lease, have drinks at four awesome local breweries, and help raise money for Almost Home Canine Rescue at the and annual Hops & Hondas Tour. Visit each brewery, or tour stop, and get your “passport” stamped to be entered to win a Vern Eide prize package valued at over $750! While at each tour stop, you’re allowed one entry (4 total entries) to win a 2-year 2019 Honda Passport lease! Plus, at each tour stop, you could win a $50 tab or brewery prize pack to that brewery!